You’ve probably heard mention of Six Sigma methodology in reference to large manufacturing businesses like GE and Motorola, two of its most vocal supporters, but as a project manager, have you ever considered how useful Six Sigma could be for you and your team? Regardless of the industry, companies need to develop efficient processes to complete projects and stay relevant. 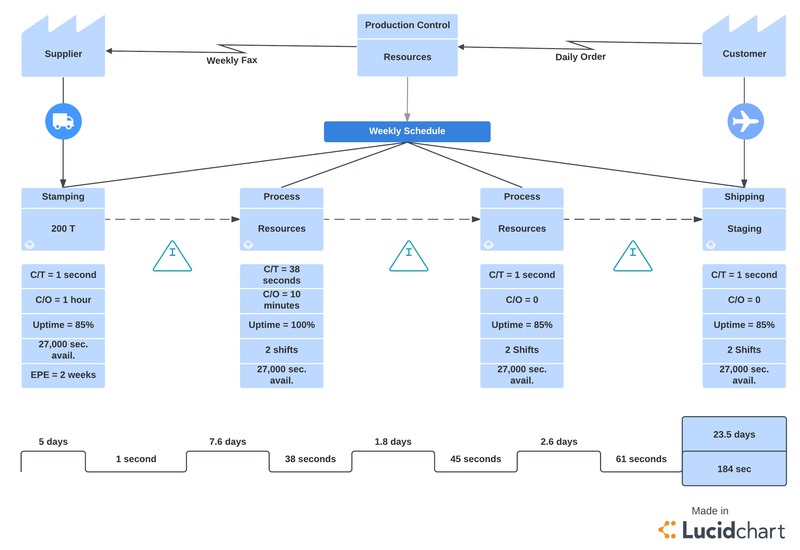 While your goals may not fit perfectly within a Six Sigma framework, you and your team stand to benefit from the boost in efficiency a Six Sigma mindset—maximized with the right Lucidchart template—can create. Read on to find out how. Want a quicker way to decide if Six Sigma is a fit? Check out our ultimate guide to project management methodologies in fun flowchart format. What is Six Sigma methodology? In case your business school notes on Six Sigma have (understandably) blurred over the years, Six Sigma is a methodology used to find and address the weak points in a process that hinder efficiency or that result in more errors than is ideal. Six Sigma specifically refers to the goal of reducing the number of manufacturing defects to less than 3.4 per 1 million units. Over the years, however, Six Sigma’s usefulness has expanded far beyond the world of manufacturing to help a diverse assortment of companies like Amazon, Xerox, and Starwood Hotels save money by improving efficiency. By visualizing how your product or service goes from an idea to your customer's hands, you can start identifying ways to increase efficiency and quality, which is what the six sigma methodology is all about. How is Six Sigma Methodology applied at a company? On its own, Six Sigma has specific terms of application, generally empirical, within a business. As a project manager, you can choose how much or how little you’d like to adopt those terms. To implement Six Sigma as it was designed, you or someone at your company must become certified through a business school or online program, both of which are widely available and offer different certification paths depending on your needs. Though Six Sigma relies on strong leadership to push a project forward, one of the tenets of the methodology is that every single person in the organization must be committed to and understand the effort, especially top-tier management. This is the point of the project when having a clear visual roadmap for employees in the form of a Lucidchart template will foster communication, keep everyone aware of their roles, and make sure employees remain invested in the project’s success. Master Black Belt: The in-house authority and coach for Six Sigma, trained and certified. Black Belt: Employees who assist and report to Master Black Belt, often trained and certified. Green Belt: Employees who incorporate Six Sigma into their daily job responsibilities, sometimes trained. As project manager, you have the option to decide whether this kind of restructuring would make sense within your organization and for your project’s goals. "What is the objective of this project? Is it to introduce new technology? Is it going to result in changing a job more than 50%? Is this project going to lead to efficiency gains?" The answers to these questions help him to define the scope of his project. Once he has a clear idea of the project scope, he asks himself which tools in his toolbox are the best fit for the project - Six Sigma, PMBOK, Prince 2, Agile, Waterfall etc. "I found six sigma to be most effective on operations initiatives. In part, operations have processes that could be complimented with newer technology or repeatable processes that could be centralized elsewhere, allowing the current employees room to do advanced type of activities." Once you have chosen Six Sigma as the best approach for your project, there are two main sub-methodologies that diverge slightly to allow businesses to tailor the Six Sigma approach to their project and industry. They share the same ultimate goal of improving process, but each offers a more specialized approach than one blanket methodology. If you want to try implementing either of these processes, they can be easily added to a new or existing Lucidchart template (see below). DMAIC works best for companies looking to improve the manufacturing or production aspect of a business or existing business processes. Measure: Assess the current process and its effectiveness. Analyze: Use data to evaluate current processes to find where the defects occur or where the areas of improvement are. Improve: Make changes and improve the process so it helps you meet your goals. Control: Design a system to keep the improved process in place, anticipating potential future roadblocks. DMADV works best when a company aims to create a new product or process or to improve customer or client relations. Define: Establish the client’s or customer’s need. Measure: Use data to assess customer needs, response to a product or service, and the product or service’s capabilities. Analyze: Review data and use that information to create new goals or designs to meet customer or client needs. Design: Create a product, service, or process that will better address customer needs based on findings. Verify: Test the design and either deliver it to the client or put a plan in place to monitor its success and efficacy at addressing customer needs. You may learn or hear about other methodologies under the umbrella of Six Sigma, including DFSS, DMEDI, and Lean Six Sigma. 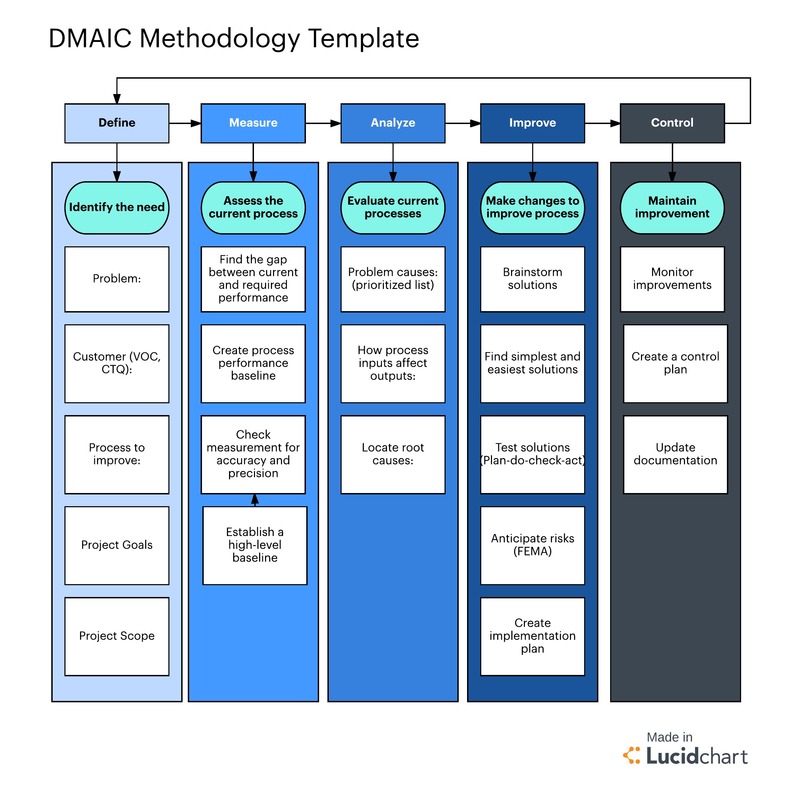 However, DMAIC and DMADV are the two most widely used sub-methodologies. What can it do for project managers? As a project manager, you have your own method of setting up a project and seeing it through its various stages, so abandoning your current practices in favor of a brand-new methodology would likely present significant challenges in your workplace. Instead, borrow from the Six Sigma methodology and adapt it to your projects and industry to improve your chances of success. You can do this easily with Lucidchart. One reason Six Sigma methodology is so effective is that it places an emphasis on clear organization from the start. Many projects fail not because of poor goals or contributor errors but because of organizational issues that can be traced back to the project’s inception. Use a Lucidchart document to create a framework for an organized, clearly defined process. Even if your plan deviates from DMAIC or DMADV, you can still benefit from Six Sigma’s emphasis on clearly defined steps and its concrete, empirical approach. Further, project management in itself is a process. The steps you take to ensure a project’s success are all part of a larger process that could always be improved. If you take the time to do a DMAIC-style assessment of the way you and your team manage projects, you could uncover weak spots and areas for improvement you weren’t aware of before. 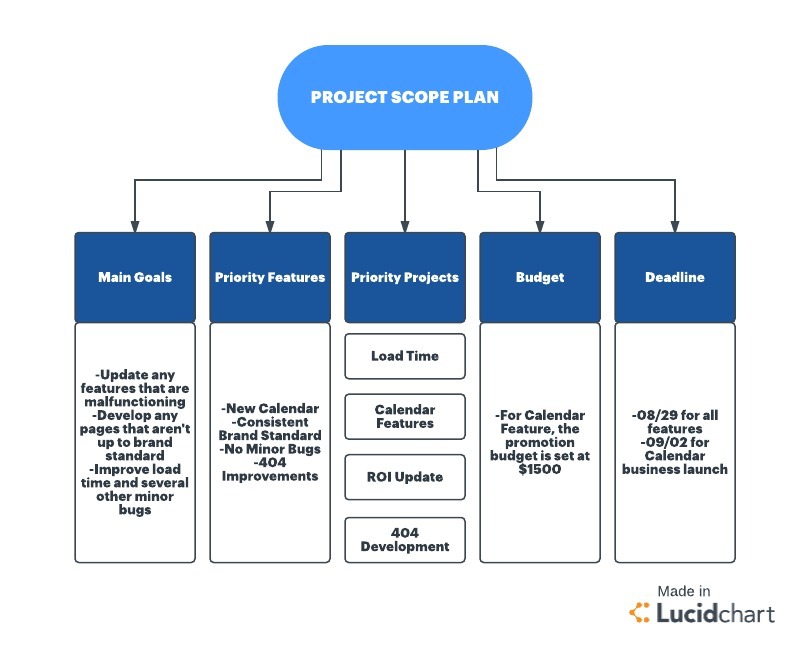 After you assess your project, you can create a new template using Lucidchart specifically for project management. It will help you streamline processes across a team of project managers, maintaining consistency across large organizations working on a range of objectives. Six Sigma methodlolgy may have roots in manufacturing, but its broad, widely applicable principles have given it a respected reputation far beyond the warehouses of GE and Motorola. If your team is struggling to understand failures or unexpected results, taking a Six Sigma-inspired approach will help you comb through your process to find any gaps. Even if your team has already been successful at achieving its goals, Six Sigma’s approachable steps could help you better use data to measure your wins and areas for improvement. By taking pieces of this proven methodology and adapting it to your existing workflow with the right Lucidchart template, your projects will have every reason to succeed. Six Sigma might not work for every project - what other methodologies could you use? Which project management methodology is right for you? Use this flowchart to find out!